.Our student projects can be tailored to suit Honours, Masters, and PhD degree requirements. For further information, or to express your interest in any of the following projects, contact us. 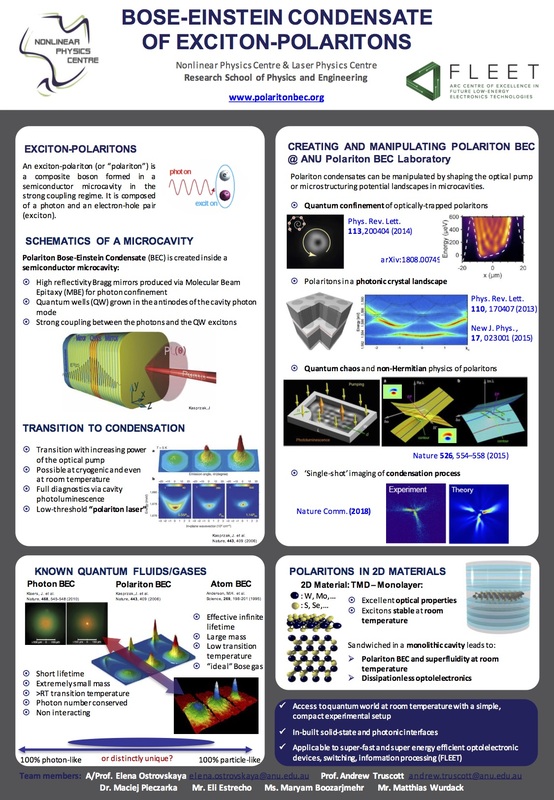 The aim of this project is to investigate the applied properties of polariton BEC and thereby accelerate the development of the next generation of quantum and optoelectronic devices. The potential impact of a BEC in a solid state material for harnessing novel collective quantum effects for future applications of optoelectronics and precision sensors is substantial. Quantum physics has had a huge impact on modern society, it has been responsible for the transistor, laser, and Magnetic Resonance Imaging (MRI) to name but a few critical technologies. The hybrid light-matter properties of polaritons makes them particularly appealing for integration into optoelectronic devices. The merging of polaritons and optoelectronics into a single device is so promising that it has spawned the new field of polaritonics. Polaritonics has the capability to enhance existing optoelectronic devices and to enable next generation optoelectronic devices including integrated optical circuits, classical and quantum logic elements, optical switches, and spin-memory elements. The hybrid matter-light nature of polariton BECs make them ideally suited to fundamental investigations. The important fundamental problems that this project will investigate include non-equilibrium dynamics and polariton BEC coherence. The concept that a BEC can form in a solid state material with reduced dimensionality is remarkable. It is the aim of this project is to systematically investigate polariton BEC coherence including its onset and ubsequent time evolution. Moreover, we aim to investigate how the polariton BEC coherence is influenced by non-equilibrium dynamics, trap geometry, pumping, and losses. The fundamental understanding of non-equilibrium systems had been recognised a one of the grand challenges in physics today. Due to the inherently open-dissipative nature of the polariton BEC system, it is an excellent platform for non-equilibrium studies. This project will investigate collective behaviour of polariton condensates in structured microcavities and their manipulation by optical pumping. Dr. Eli Estrecho holding a mask used to structure the laser pump. Image by Stuart Hay, ANU.